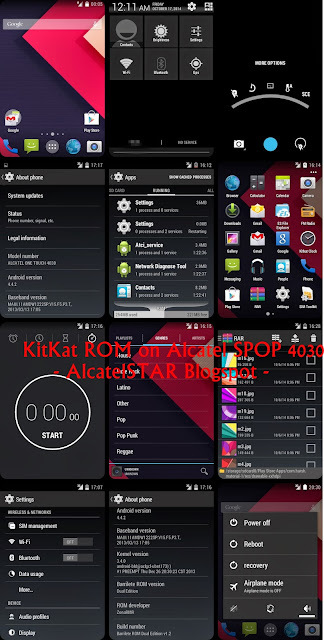 Get the ROM of Android KitKat on your Alcatel SPOP 4030/GLORY2 single or dual sim. This ROM is themed 99% like Android 4.4 KitKat, it brings amazing looks from original KitKat version almost indistinguishable to the original. Specially it's developed for dual sim version of device but it works seamlessly on single sim variant. I'm think it's the best aftermarket ROM available yet for Alcatel SPOP 4030/GLORY2, also more than stock ROMs. Barrilete KitKat edition is stable ROM with fastest & smoothest running with with the possibility of hard-multitasking. Do not worry about lag or low RAM slowdown, these things do not appear or just not happening. 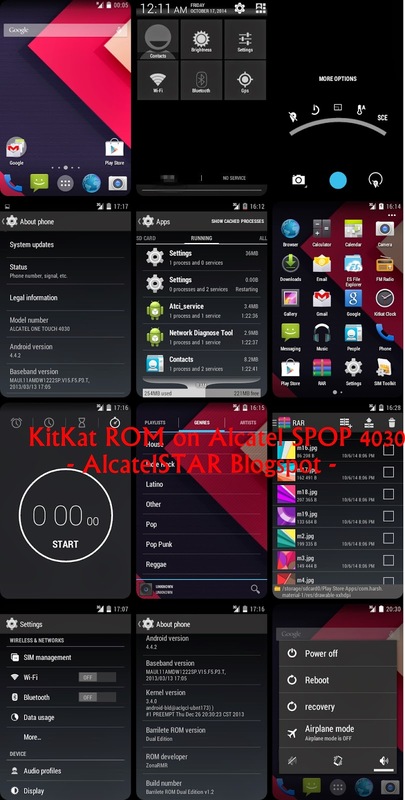 By the end you will not make a mistake if you install this ROM on your Alcatel SPOP. You need from CWM or TWRP recovery check out this post. Download ROM from below and put into your sdcard. Wait zip to be installed on your device. Wait some time for installation! note: first boot can take some time don't worry it's normal just be patient! 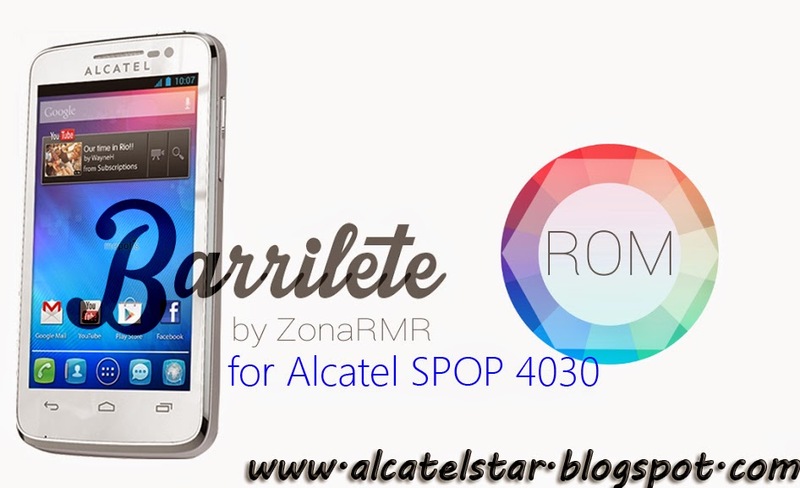 Barrilete is Custom ROM for Alcatel SPOP 4030A based on stock Android 4.1.1. 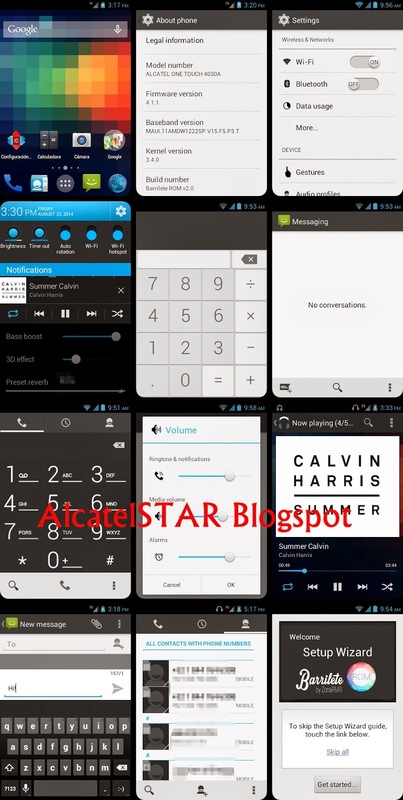 Get some cool custom ROM for your Alcatel One Touch SPOP. Barrilete has some of general distinctive qualities as: Beauty, Speed & Responsiveness. No more lag or tardiness due to less RAM memory and slow CPU, it is optimized for faster and smooth running equipted with best tweaks & improvements to freeing more RAM on your Alcatel. ROM installable throught AROMA installer for easy installation for newbies. note: It's only works with one sim version of device. You need to had from Recovery like ClockWorkMod or other custom Recovery check out this post for CWM on Alcatel SPOP. 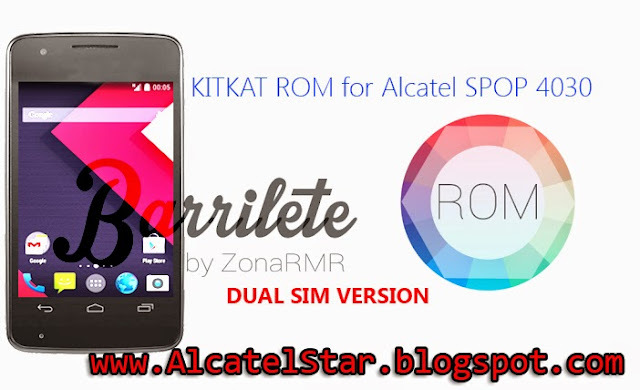 After flashing CWM recovery on your Alcatel SPOP proceed to installation of ROM. Before anything to be changed due to installing custom ROM we recommended to make backup of your ROM from CWM recovery. Download Barrilete ROM from link - here and put into root of your SD. - Wipe data/cache from menu. - Wipe dalvik cache from advanced. Flashing ROM into /system & /custpack partitions:- Install zip from sd then select / Barrilete ROM v2.0.zip /. Now you can reboot your device! note: Please be patient, until device booted it's normal because Android building data files approximately over 2-3min! We might receive donations throught PayPal.